TNC (04) - Triumph Needle Corp.
penetration force and higher fabric protection in very densely knitwears sewing. Longer and thinner needle tip - lower penetration force. One size less in the needle blade - heating reduction and lower possibility in fabric damage. Extra light ball point - protect the fabric. KN+SPI - for extra fine woven material. 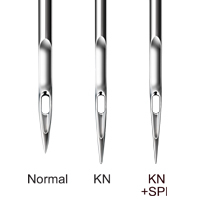 The TNC "KN" needle with "CM" ceramic coating in the needle tip will bring you two times longer life and 15% heating reduction.